Racket head speed should be an obsession in junior development. I believe that young players need to start working on whip and power early on�definitely under 12 years old--to lay the foundation for future world-class weapons. I believe that you develop technique first, and then make the forehand into a huge shot for the long term success of the player. I also believe that players at all levels can benefit tremendously from these articles to develop racket head speed. The lack of consistent weapons at the club level is a far more obvious problem than in junior tennis, and club players who take the time to really work on their racket speed may find they can progress several levels in NTRP play. So these drills are pretty much universal and not limited to the development of high performance juniors. A common developmental mistake, in my opinion, is to focus on the shape of the swing alone without an equally strong emphasis on the speed of the swing. I think this is what leads to a lot of the pushing that you see in the juniors because the kids don't have the confidence that comes from constantly going for their shots. It's a mistake to focus on swing shape only, and not swing speed. The kids with the really pretty strokes who can't rip heavy kicking topspin forehands or pound a ball down the opponent's throat simply won't reach their potential in the juniors, or thereafter. Creating more racket acceleration can be a difficult battle to win with young kids, most of whom lack much awareness of their actual swing speed. The process requires constant input. But I believe that the best coaches in the modern junior game are working not only to get the form right, but to develop the huge weapons that lead to success down the road. Now in this third article, let's add more drills, this time drills fed with a racket, rather than by hand. These drills are also common in Spain, drawn from my experience studying and training with top Spanish coaches. Let's also finish the article with a few strength building drills that mimic the strokes and help kids�and all players--develop power in a very natural, fun way. This drill is one of the most common racket speed building exercises that I see on my trips to Spain. The coach volleys the ball softly, lofting it so it floats high with little pace. The player has to execute a massive, heavy forehand generating speed not from the oncoming ball, but from his own swing. This drill is very important in helping build confidence against slow ball players in the juniors, and is a great progression from the hand fed racket speed drills in the first article. It also forces the player to develop accuracy in combination with power as he is required to return the ball to the coach for the next volley. The coach must have the skill to volley the ball and still take away all the energy. The goal is for the player to create all the pace for himself through his rotation and whip. Depending on the level, the coach should ask the player to hit 10, 20, or even more balls in a row. The key is for the player to learn to control, accuracy, and consistency, without reducing whip and racket head speed. Easier said than done, but a great drill to create the mind set to destroy pushers. The swinging volley is a regular part of racket speed drilling in Spain. This exercise develops the swinging volley, but also racket head speed on the forehand in an integrated way. The coach feeds the player 10 to 15 balls near the service line and the player must get into good position, load and then explode with whip into every ball in quick succession. The feeds can become quicker and the coach can move the ball around to challenge the player's footwork, positioning, and timing. This drill is critical to help a young player become comfortable taking the ball out of the air with maximum acceleration and no fear. At the same time this drill boosts confidence in unleashing completely on forehand groundstrokes. Here is a more advanced and difficult version of the same swinging volley drill. Now the coach doubles the speed of the feed, feeding the second ball before the first ball is even hit. This kind of overcompensation makes hitting a single ball in real time seem slow! The quick tempo of the feeds overloads and fatigues the arm building strength and endurance. The result is players with more Rafa-like confidence in their ability to whip through and crush the ball time and again in point situations. This is the racket fed version of the drill we saw in the last article using a hand feed. Its purpose is to develop racket speed when the player is on defense, and also, to develop defensive movement. The goal is to hit a high, defensive, heavy spin ball. This shot is sometimes known as the �aggressive defense� in Spain. The idea is that a very aggressive heavy spin will allow the player to neutralize the incoming ball and perhaps turn defense into offense. The player must move back with double rhythm (Spanish diagonal shuffle steps), load off the back leg, and accelerate with arm speed and body rotation. Usually this shot is hit with an open or semi-open stance. I have to credit my long time mentor Gilad Bloom, the subject of a previous article (Click Here) for creating and naming this drill. It's a favorite with my students. The title has a certain irony as the drill is not easy to do well. We all know from watching junior matches that the �easy� balls are the balls that many players miss on a regular basis, and that hitting them for winners with power and consistency is the mark of an accomplished player. The coach feeds the players short sitters near the net. The player has to load, and then explode and tee off with maximum force and racket speed, 10 to 15 times in a row. The goal is to create the mind set to punish that �easy� ball. It takes a lot of concentration, footwork, and great technique, to make 10 or 15 in a row. You can add some Spanish flavor to this drill by adding more movement and positioning and asking the player to whip the ball with more spin rather than slamming it flatter. Here the player is fed three short balls in the midcourt. The idea is to kill the ball moving forward abd wide, then moving directly forward, and then moving up and around the ball to an inside position. The player starts at the baseline, sprints to the ball, loads and explodes, and then recovers to the baseline. The player is then fed the second ball. After the kill, the player recovers again, and then receives the third ball, etc. The coach can vary the positions of the feeds as the player gets the feel for the drill. This is a great attacking movement exercise, emphasizing maximum whip and racket speed. It works on the most common kill shot situations, building the player's comfort and confidence in finishing the point. To develop a great forehand weapon, players need to have no fear in pulling the trigger and ripping a big forehand. These midcourt kill shots are not practiced nearly enough by most American coaches, in my opinion. One of the separations between mid-ranked national players and top ranked international/national players is the consistency of their kill shots. Most highly ranked kids are pretty solid laterally, but the best kids move forward on the diagonals, jump all over short balls, and rip them for winners consistently. Hey club players, it can be the same for you. All these drills apply. You just have to practice the shots you actually want to hit in matches, that is, if you actually want to hit them in matches, instead of merely dreaming about doing it. Renowned physical trainer Pat Etcheberry (Click Here to see his training system on Tennisplayer) developed this swing trainer and I like to use it in workouts with my players. I'm not big on gimmicks, but I've found this swing trainer to be valuable tool. It looks cool and the kids always enjoy working with it. For more info about getting an EtchSwing, Click Here. Players can perform sets of 10 to 15 repetitions. They can use the trainer off court, or even on the court when waiting for the next drill in group situations. I like this drill because the player is actually building strength by practicing the correct technical swing. Here, I have one of my future superstars using the trainer to build that big forehand gun. He's 9 now but watch out when he hits 16. He's going to have a weapon of mass destruction. This is a great superset drill. Work the Etch Swing 10 times and then immediately transition to the regular racket for 10 more reps, what the Spanish call The Wind Exercise. The Etch Swing makes the racket feel like a toothpick in the player's hand and this makes this drill a great way to work on whip. The classic Spanish wind exercise can also be performed solo for 10-15 repetitions. The goal is for the player to load and unload, accelerating the racket so fast, one can hear the wind whistling through the strings. This drill is analogous to working the speed bag or shadow punching in boxing. Another option to develop strength and power is to hold two rackets or tape two rackets together if the player can't control them both with the racket hand. Now have the player swing the double weight for 10-12 repetitions. Lead tape can be also used for a less extreme effect. An old 15 ounce wooden racquet makes a great heavy swing trainer. For me, this is like working the heavy bag in boxing rather than the speed bag. It facilitates power development in a slightly different, complementary way. Just be careful with the shoulders of young players. Don't overdo this drill. A little goes a long way. Use an appropriate weight for the age and strength of a student and monitor any sign of shoulder strain very carefully. Medicine ball training is absolutely one of the best ways to train power in players. It should have a regular place in every kid's training regimen�both on and off court. And adult players can benefit just as much. The medicine ball is so versatile and allows for very tennis specific training. The kids love it and you can use it to play a variety of mini tennis games. In this first drill I am doing the feeds. Notice that my player is alternating neutral and open stance. Watch how closely her physical movements correspond to her actual swing, and the depth of the loading in the open stance version. The kids probably enjoy doing these drills with each other more than with the coach. Here both players are required to throw with neutral stance. Notice that since the players aren't perfectly accurate with their throws, their partners are forced to work on movement and positioning as well, in order to execute the neutral stance. Again the correspondence with the strokes and court movement is one of the things that makes medicine ball drills so great. This last exercise is the same except that the players now must set up and throw from an open stance. Again notice how this promotes the development of great strength in the load and explode phase. As with the Etch trainer, the player feels lighter than air when he goes back to doing the same movements with the racket. These are just a few of the possible exercises coaches can use and all of the ones I have presented can of course have multiple vartiations. I hope they spur the imagination of coaches to design innovative exercises to facilitate better weapon, power, and racket speed development in their players' games. Next, I will give my opinions about some of the problems coaches run into in traditional junior teaching that limit the development of explosive weapons. Stay tuned! Special thanks to my students Sean Mullins, Will Coad, and Lia Kiam for the doing the awesome demonstrations of the Spanish forehand that made this article possible. Chris Lewit, USTA High Performance Coach and author of The Tennis Technique Bible, is an innovative leader in the high performance coaching community. 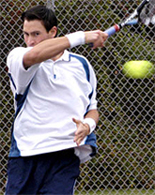 Chris played #1 for Cornell University and competed on the professional Satellite and Futures Tours. Chris has developed many international and national level junior players, including several top 10 USTA nationally ranked players. This article is excerpted from Chris's current book project, The Secrets of Spanish Tennis. Please visit www.chrislewit.com for more info about Chris, his books, or his academy in New York. For More Info or to Order an Etch Swing, Click Here!